Very few cricketers are as humble as the former captain of India MS Dhoni. Very few cricketers are as humble as the former captain of India MS Dhoni. Once again, he gave his fans a glimpse of that when he met the ground staff at the Chinnaswamy Stadium. 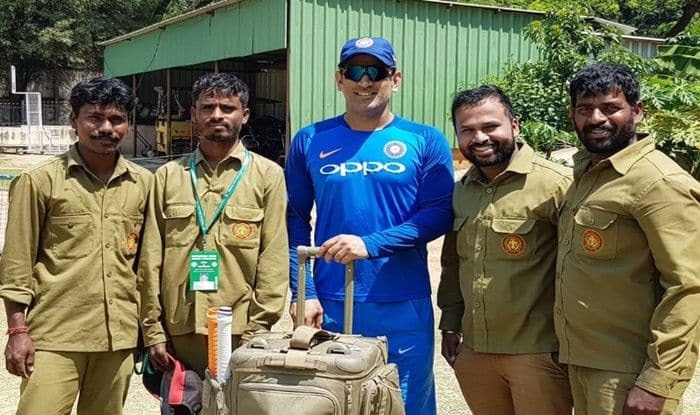 The 37-year-old was patient enough to get himself clicked along with the men who work behind the scenes. This is not the first time we have spotted MS Dhoni catching up with the ground staff and sharing a light moment or two. Being one of the most popular figures in the fraternity, Dhoni is often the centre of attraction wherever he goes; be it Napier or Vizag. Here ate pictures of Dhoni obliging the ground staff with selfies. Meanwhile, Dhoni slow 37-ball 29 came under fire after India lost the match, despite the former captain emerging as the top-scorer in the low-scoring encounter at Vizag. Meanwhile, the focus remains firmly on the World Cup but India would also be desperate to ensure that a home series does not slip out of their grip when they take on Australia in the second and final T20 International in Bengaluru on Wednesday. India is 0-1 down after an inexplicably poor batting performance led to a three-wicket loss in the lung-opener in Visakhapatnam. The below-par 126 with the bat on Sunday denied bowlers a decent shot at securing a win even though the Jasprit Bumrah-led attack did all it could to keep the home team in the game till the final over of the match.